Apparently this artificial eye has been in the news since 2006, but I came across it only last night thanks to the Montague Heritage Services facebook page. But it is not just the eye that is of interest, perhaps the only reason is was recognised so quickly as an artifical eye, was its location in the socket of an adult female, buried in a site known as the Burnt City (site name: Shahr-e Sukhte), near Zahedan, Iran. The unusally tall (1.82m), 25-30 year old women wore the prosthesis with the aid of a golden thread inserted either side of the hemispherical disc. The piece was decorated with a central circle, perhaps representing the pupil lines spreading outward from the circle like “rays”. It is thought that the individual may have developed an absess from wearing the disc. The excavation is led by Dr. Mansour Seyed Sajjadi. The BBC and A Blog about History report that Worsley Man, discovered in a bog in 1958, has recently undergone a CAT scan. The male, aged at 20-30, appears to have been “bludgeoned over the head, garrotted then beheaded.” Evidence also suggests a ligature around the neck. Lindow man, thought to have lived 150 year earlier than Worseley (50BC), may also have been garrotted, and had his throat slit. So far, there are no images available from the back of the skull. The beeb has a nice little video above, but far too short. 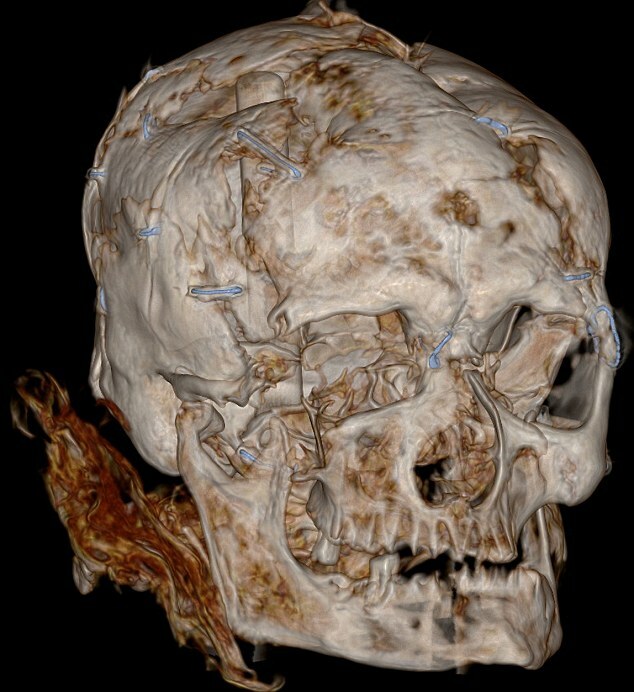 CAT scan of Worsley Man, staples holding the skull together are in blue. While researching this, I came across this snazzy video on the Hudermose Woman, of whom I had not previously heard. Can’t beat those bog bodies.